The popular view when Azhar Ali was announced as Misbah's successor to lead the ODI team was that the PCB had taken a step backwards. Public opinion, and that of some experts, was that the PCB had not learnt from its past mistakes. Having seen the ODI team crumble under the defensive tactics of Misbah, the predominant view was that Pakistan required an aggressive captain and the modern day approach to ODI cricket. I was also skeptical about Azhar Ali as the ODI captain. I never doubted his ability as an ODI batsman and also called for his inclusion in the team in the past, but as captain I had my doubts. We ran a poll on Boys in Green, and also wrote a letter to the PCB Chairman about it including our poll results, which showed that Azhar Ali was the least popular choice among fans. With such a negative reaction prior to even taking the field as captain, Azhar Ali must have felt the world's burden on his shoulders. He must have felt that he needed to prove the fans wrong, the experts wrong, and above all he needed to prove to himself and his team that he belonged. With such pressure, any lesser batsman / person would have crumbled. Azhar Ali stood up to the challenge, took it head on by opening the batting, and slogged each one of his critics out of the park. As an opener, Azhar Ali has been a revelation! Azhar Ali stands above and beyond all openers Pakistan has ever had in its entire ODI history. His average of 63.84 as an opener is almost 18 runs more than the next best average of a Pakistan opener. The most pleasantly surprising fact is that Azhar has the best strike rate among all Pakistan openers; even better than the legendary Saeed Anwar's. Unlike Misbah the ODI captain, Azhar Ali decided to take charge of the ODI team and lead from the front by moving out of his comfort zone and adopting an attacking style of play at the top of the order. He showed everyone that it could be done and naturally demanded the same of his players, which has resulted in the consistently high ODI scores that Pakistan has been posting; a welcome change from the struggle to 220-230 over the past 4 years. 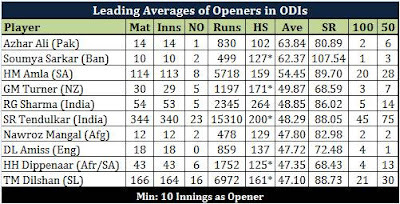 Sure it is still early days for Azhar Ali, but at the moment he is at the top of the pile in terms of average among all openers ever to play ODI cricket (with a minimum of 10 innings as an opener). 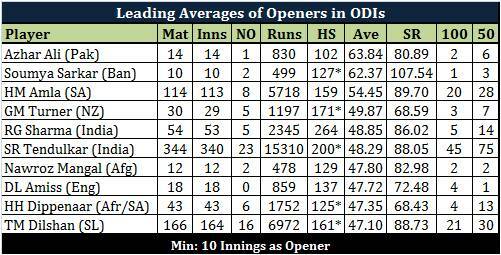 Azhar is among the only 3 openers in ODI cricket who average above 50. He recently created a Pakistan record when he completed 1,000 runs in ODI cricket in his 23rd inning. He equaled the great Gordon Greenidge, and got there in 2 innings fewer than Sir Viv Richards and Kevin Pietersen. 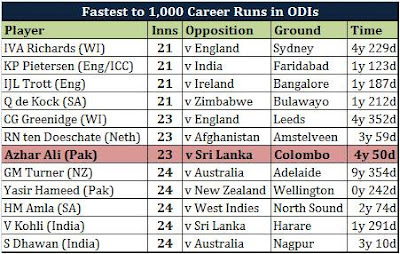 Azhar Ali reached 1,000 ODI runs faster than modern ODI greats like Virat Kohli, Hashim Amla, and AB De Villiers, and faster than the all time great ODI batsmen like Sachin Tendulkar, Brian Lara, Ricky Ponting, and Inzamam Ul Haq. At the moment, Azhar Ali is among the only 8 ODI batsmen in the history of ODI cricket who average over 50 (minimum: 1,000 ODI runs). The other names on that list include Hashim Amla, AB De Villiers, MS Dhoni, Virat Kohli, Michael Bevan. Talk about being a part of elite company. He is also among the few ODI batsmen who average over 50 as captain. The top of that list reads Virat Kohli (70.8), AB De Villiers (69.8), and Azhar Ali (65.0). Azhar Ali has not only shone alone as an opener in ODIs; he has always ensured that Pakistan get off to a good solid start by building a strong opening stand. In the 14 ODIs that he has has opened in, he has had 4 different opening partners, and he has been able to forge a strong partnership with each one of them. All those recent claims that Azhar Ali is a selfish batsman are baseless in my opinion. He has taken responsibility on his own shoulders, he has taken up a role that has traditionally given Pakistan the most problems, and he has stood above all batsmen currently playing ODI cricket. He has flourished as an opener. I will be the first to say that these are still early days, but the glimpses that Azhar Ali has shown in this short period have demonstrated an ability that will bring Pakistan back to being a force to reckon with in ODI cricket.